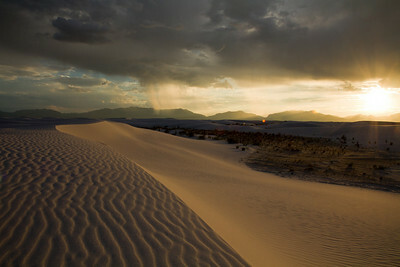 Matt Holland Photography: White Sands, one of the most beautiful places on earth. White Sands, one of the most beautiful places on earth. After I spent a couple days in Colorado, I headed south towards Texas, and stopped at White Sands National Monument for a lovely sunset. As far as I'm concerned White Sands is one of the most beautiful places on earth. I've been there many times over the years, since my grandparents have a cabin nearby, but this was White Sands at it's most beautiful. The golden sunset behind the mountains, combined with the nearby storms really were a sight to see. This 360 degree panorama needs to be viewed large to really be appreciated. Just click to open it up and take in the view. I'd love to have a chance to spend a couple days there sometime, maybe next time I am in the neighborhood! 30 blogging moms and a bundle of baked goods!